Vol. IV, 1 of the C.P.E. 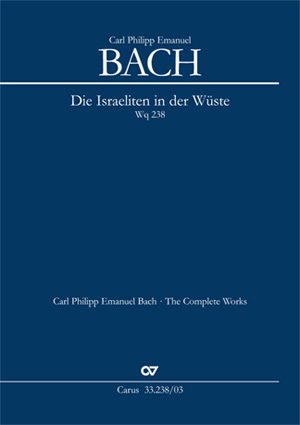 Bach Complete Edition, edited by the Packard Humanities Institute According to C.P.E. 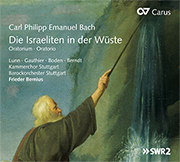 Bach, the oratorio "Die Israeliten in der Wüste” [“The Israelites in the Wilderness”] can be performed “... at all times, inside and outside the church, simply to the praise of God”. The composition depicts the Israelites’ journey, full of privations, through the wilderness, their despair and their pleading. This harmonically bold work was first published in 1775 and received numerous performances during the composer’s lifetime in German-speaking countries. Das vor allem in den Solopartien virtuose Werk ist für konzerterfahrende ambitionierte Chöre eine lohnenswerte Entdeckung.